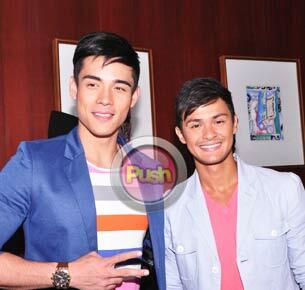 Xian Lim and Matteo Guidicelli share how their parents played a crucial role in helping them discover what they're good at. Promil Pre-school i-Shine Talent Camp hosts Matteo Guidicelli and Xian Lim attest to the fact that proper guidance from parents or guardians would help boost a child’s talent and confidence. Just like these two talented Kapamilya stars, the 12 i-Shiners have started training under top notch celebrity mentors who will hone their talent in singing, acting, dancing and hosting. In the meantime, the quest for Promil Pre-school’s Online i-Shiner has begun! It is open to children above 3 years old to 7 years old. Just buy and Promil Pre-School pack size, capture your child’s talent in video (singing, dancing, acting, playing musical instruments or combination of the four) and upload to http://ishine.abs-cbn.com or send to Wyeth PO Box 1207. Deadline of submission is on July 13. Twenty entries will be posted for online voting from July 18 to 24,2012. What are you waiting for? Join now and get the chance to win PHP30,000, Promil Pre-School gift pack plus a guest appearance on the grand finale of i-Shine Talent Camp TV show!